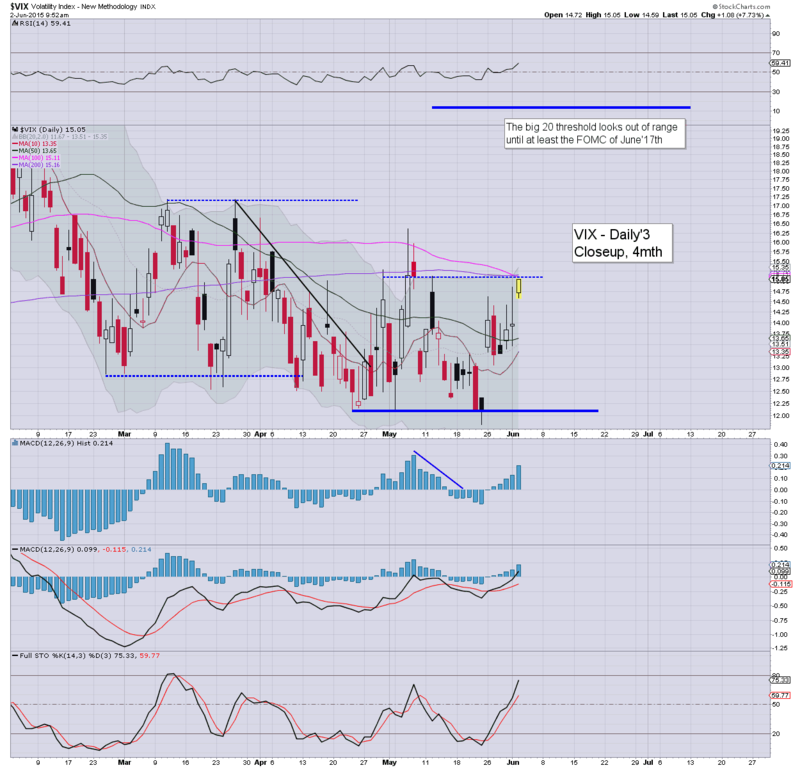 It was a choppy day in VIX land, with a morning high of 15.05, but cooling into the early afternoon as equities turned positive (intra low 13.59), but settling +2.3% @ 14.29. 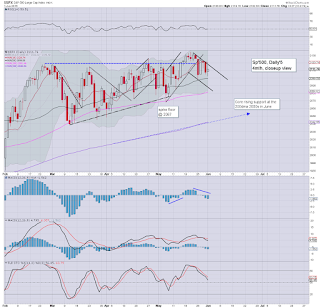 Near term outlook is for renewed equity weakness to the sp'2080s, which should equate to VIX 16s. Little to add. 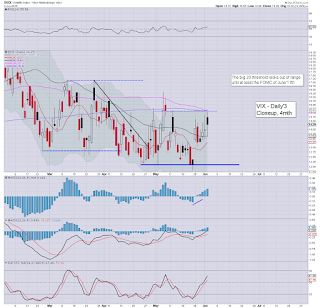 At best, equity bears look set for the sp'2080s.. which should equate to VIX in the 16s. 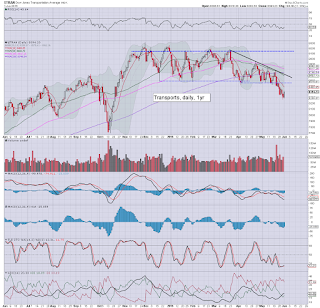 Certainly though, the big 20 threshold looks out of range in the near term. US equities closed moderately mixed, sp -2pts @ 2109 (intra low 2099). The two leaders - Trans/R2K, both settled higher by around 0.2%. Near term outlook is for further weakness to the 2090/80 zone, and then renewed strength into the next FOMC of June 17th. So.. once again the market has got stuck at declining trend/resistance.. this time maxing out at sp'2117, a mere 2pts below yesterdays high. There is an awful lot of econ/events scheduled across the rest of the week, I find it hard to believe the equity bears won't be able to at least briefly whack the market into the sp'2080s. Declining trend/resistance has held at sp'2117, and the day is playing out very similar to Monday afternoon. 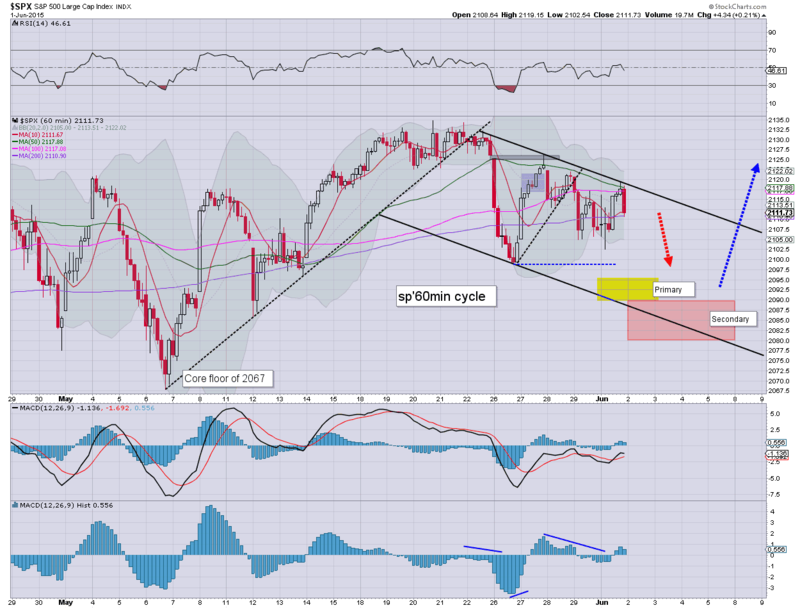 There is renewed opportunity for weakness into the close. USD remains weak, -1.6%. Gold +$4. Oil has held sig' gains of 1.7%. A net daily decline would be pretty useful for the bears... although a sub' 2100 close looks out of range. 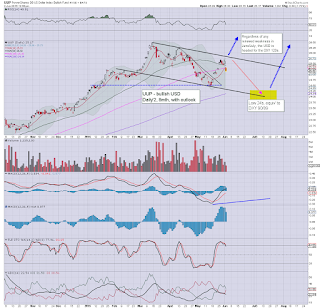 notable strength: BTU +11%.. although 11% of a small price (having collapsed) still makes for a low price. US equities are holding around the declining trend/resistance.. currently @ sp'2117, and it remains a very borderline situation for those bears seeking downside to a mere 2090/80. USD remains increasingly weak, -1.7% @ DXY 95.70s. Gold is holding moderate gains of $5, with Silver +0.6%. 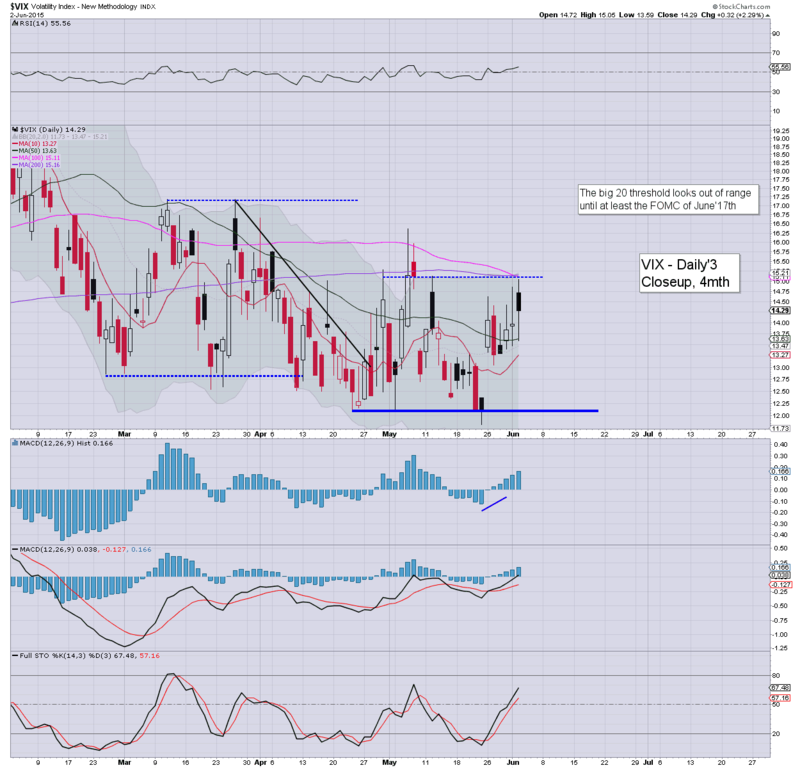 *VIX sure isn't reflecting any particular market concern.. considering the Greeks remain on the edge of a cliff. A daily close >2120 would be white flag territory for the bears..
Just like yesterday afternoon, the market is again testing declining trend/resistance.. currently around sp'2118. 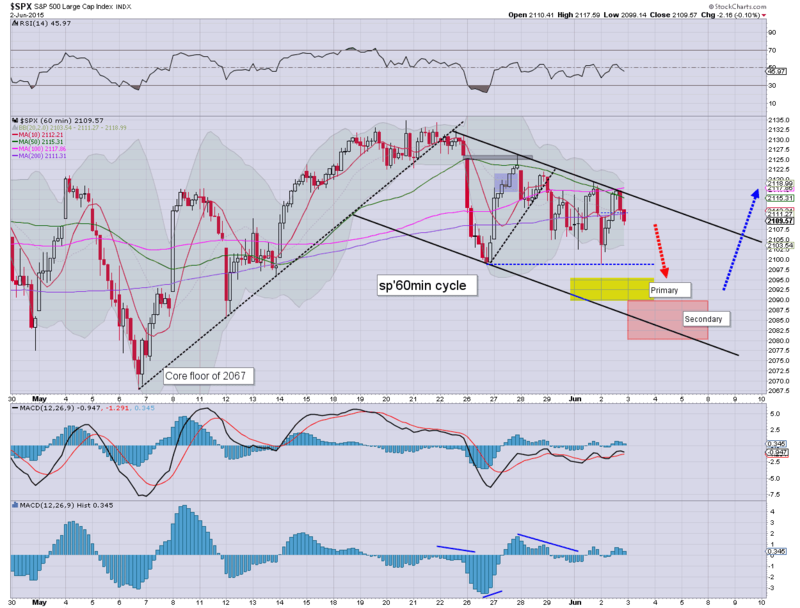 A break into the 2120s would negate the near term downside target of 2090/80 zone. USD continues to slide, -1.6% in the DXY 95.80s. Metals and Oil are naturally being pressured upward. Once again... we're close to a bullish breakout. Yet seriously... who wants to buy here? 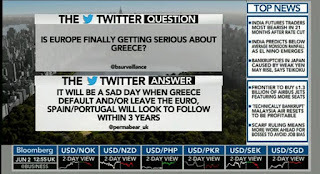 The Greeks... has a great deal to answer for.. not least in how they are messing this market around. Its getting real tiresome. *As for Blatter quitting... I guess that is bullish for FIFA. US equities remain choppy... leaning on the weak side, a daily close under the sp'2100 remains viable.. along with VIX 15s. USD remains weak, -1.2% in the DXY 96.10s. 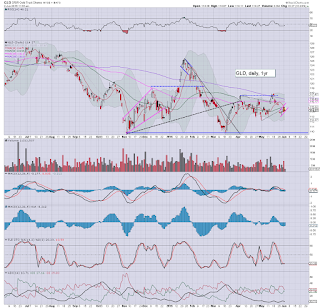 Metals are looking vulnerable, Gold +$3... price structure is a clear bear flag. *considering the drop in the USD, the precious metals are performing badly. 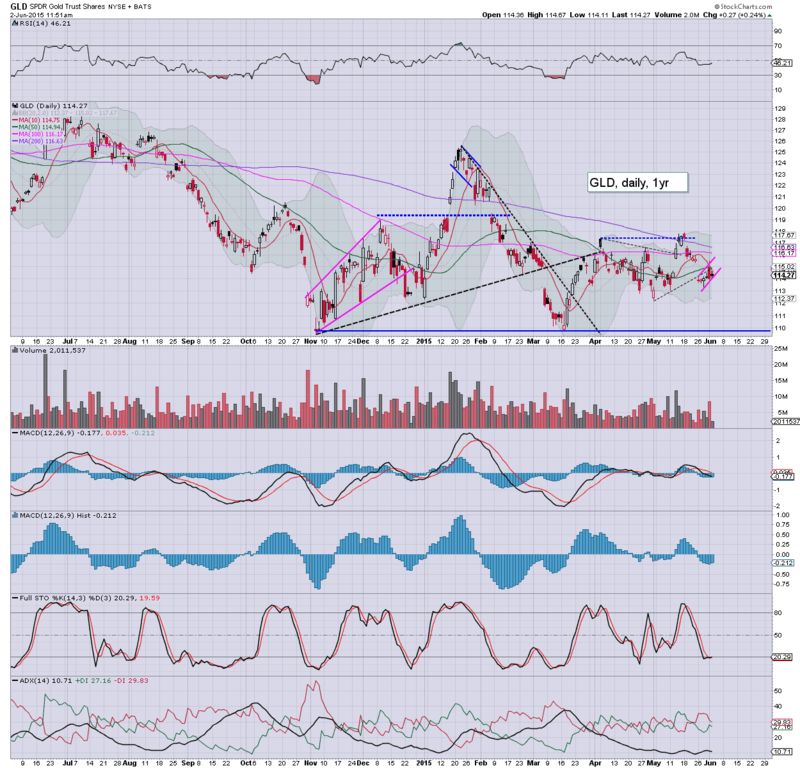 Another sig' down day looks due, at least of $15/20.. with GLD in the 112.25/111.75 zone. Little to add.. on what is another day of minor swings. 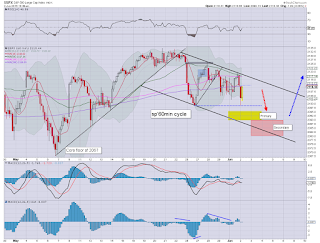 Further downside looks due to the sp'2090/80 zone.. before some kind of Greek agreement is reached.. but that will only can-kick into July or so. 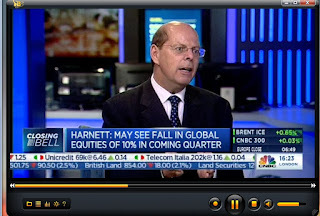 Certainly, a 10% drop is very viable.. although some markets - notably China, would be vulnerable to a rather severe 25/30% before resuming higher. 12.06pm.. Indexes just jumped.... (news?).... sp'2114. Resistance is now 2118... a move much above that would really mess up the near term outlook. A minor up wave in the US equity market (for no apparent reason).. and most indexes are only fractionally lower. Regardless.. the market remains twitchy.. highly susceptible to sporadic Greek news. 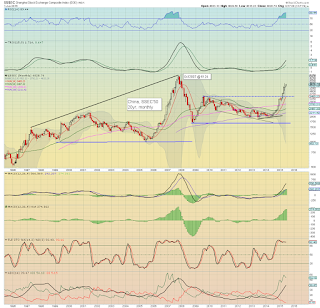 USD remains significantly weak, -1.3% @ DXY 96.10s. Gold is holding moderate gains, +$5. 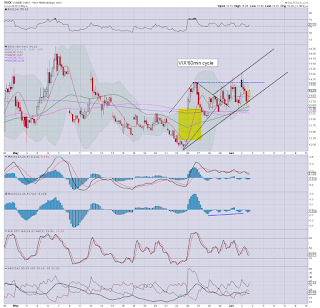 A core issue remains.. will the USD see another down wave before beginning the hyper-ramp to the DXY 120s? Best guess? Yes.. although we might briefly see 98/99s within the near term before the Greeks agree to kick the can into July. We're certainly seeing some dynamic moves already today. There is little doubt we're headed broadly lower across today.. and probably into early tomorrow. Lower trend is offering a daily close of sp -24pts @ 2087.. that'd be likely equate to VIX 16s... which is probably close to as good as it will get for the bears this week. 10.01am Factory orders: -0.4%.. vs prev. 2.1%... lousy number... nothing good there. 10.31am.. so.. the usual nonsense rebound.. but still... market remains broadly weak. Good morning. Futures are moderately lower, sp -7pts, we're set to open at 2104. 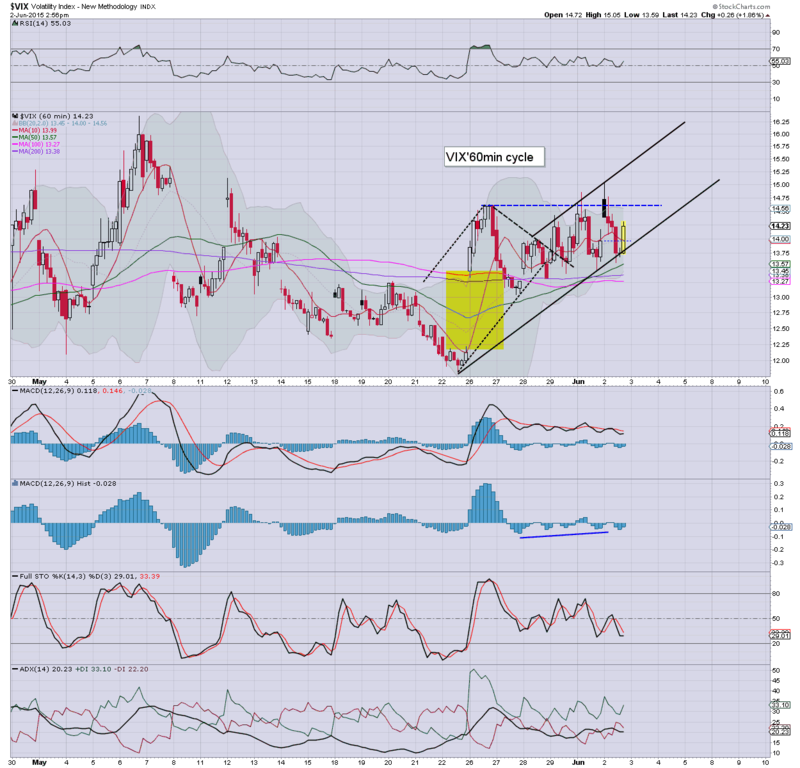 The USD has swung lower on Greek chatter, -0.7% @ DXY 96.80s. 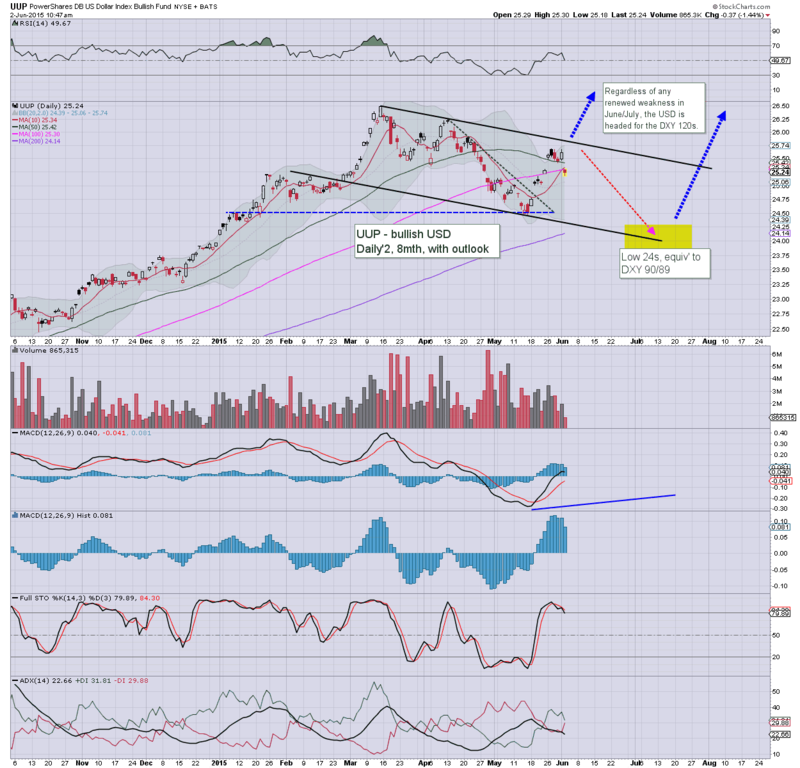 Metals are duly a little higher, Gold +$3. Oil has built early sig' gains of 1.2%. Equity futures have seen some strong overnight swings, the sp' was -15pts at one point. We're seeing the usual jumpy price action based on sporadic chatter about Greece. 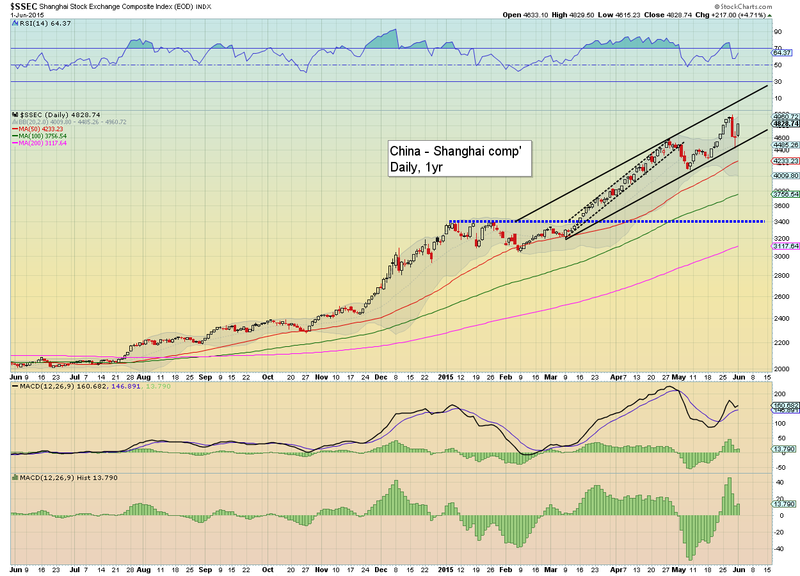 China saw a second day of strong gains, settling +1.7% @ 4910... 5K is due this week. As for US equities today... a break under the recent low of 2099 looks due... which should clarify we are headed to the 2090/80 zone... before the Friday jobs data/OPEC meeting. 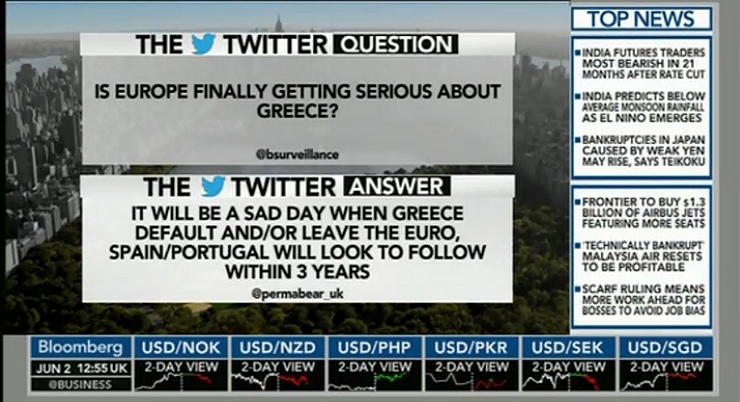 One of the Bloomberg hosts was utterly ironic with his response that the problem 'is contained to Greece'... it was essentially in the style of Bernanke (talking about the housing market) from 2007/08. It remains bizarre how most analysts are almost completely oblivious (or should that be denial?) of the chronic economic problems within Spain - the ugliest of the EU PIIGS. With mass unemployment, a society fractured (have we forgotten about Catalonia?)... the Spanish people will be screaming to follow Greece when the next major financial crisis hits. 9.17am.. the USD is getting smashed, -1.5% in the DXY 95.90s, as the Euro jumps on more nonsense Greek chatter. Metals have naturally jumped, Gold +$7. 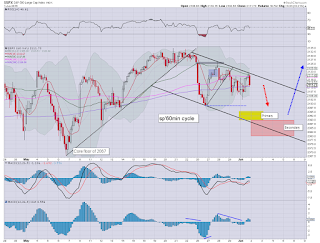 Equities remain moderately weak, sp -6pts... 2105. 9.43am.. 50dma of sp'2099.50.. .taken out.... empty air down to the 2080s. 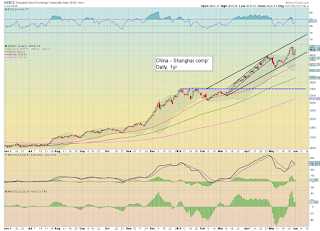 The Chinese equity market began the month with renewed hyper strength, +4.7% @ 4828. The giant psy' level of 5K remains an obvious target. 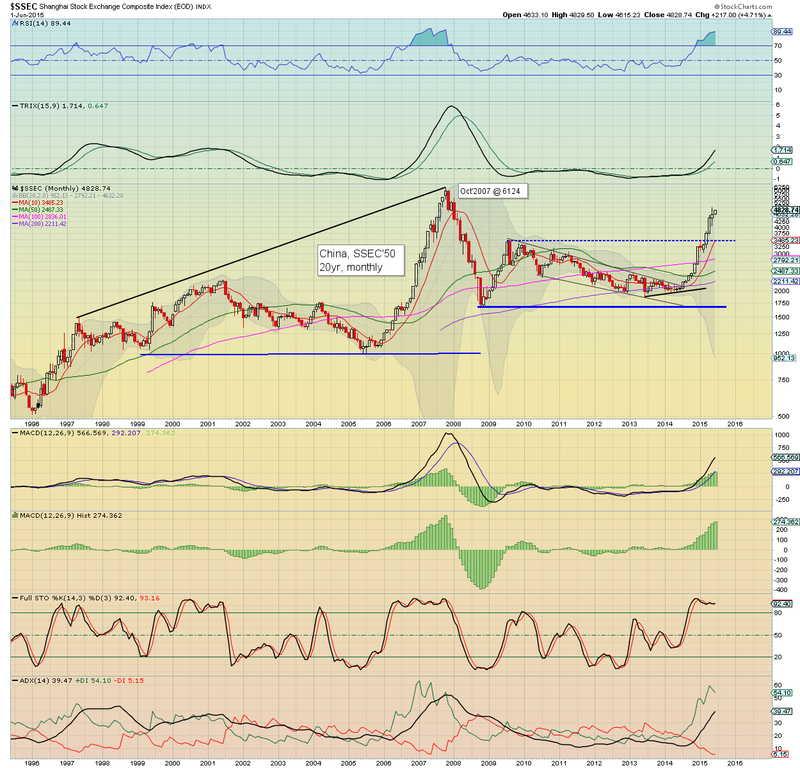 With the Shanghai comp' having ramped from 1991 (May 2014)... a major retrace is increasingly due this summer... probably to the 3400s. Suffice to add.. regardless of whether 5K is broken in the near term... a major retrace across most world equity markets looks increasingly due this summer. For the SSEC, the natural downside target would be the key 3400 breakout level. If correct, that would really spook the amateur China retail investor (or should that be gambler?). 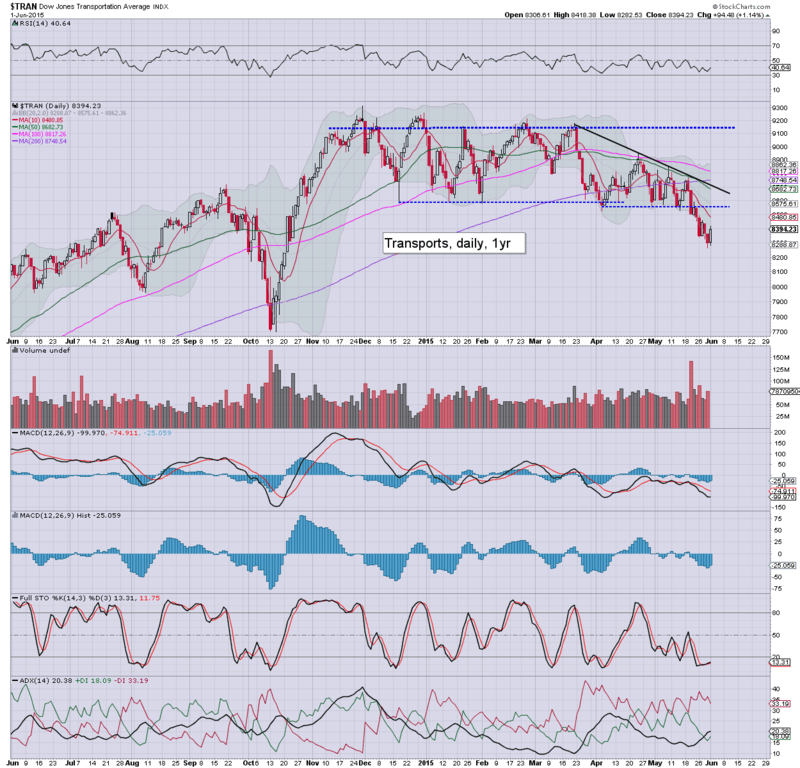 Regardless of any summer/autumnal downside... the broader trend remains hyper-strong. US equities closed moderately higher, sp +4pts @ 2111 (intra high 2119). The two leaders - Trans/R2K, settled higher by 1.1% and 0.2% respectively. 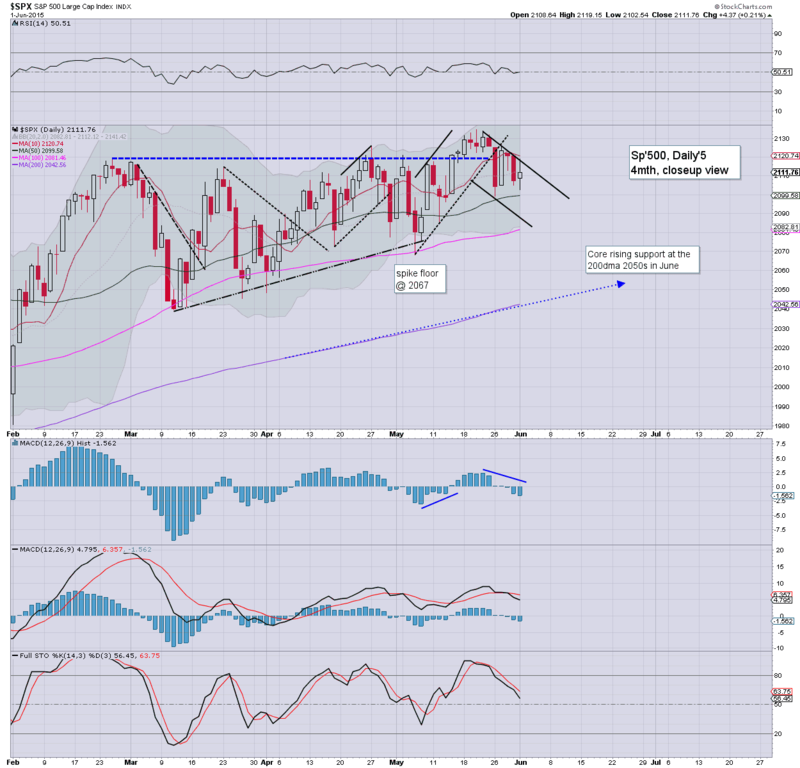 Near term outlook remains for weakness to the 2090/80 zone, before renewed upside into the FOMC of June 17'th. A bit of a mixed day of moderate chop. Further weakness to the sp'2090/80 zone seems probable ahead of the Friday jobs data... before renewed strength into the next FOMC of June 17th.